Turn your URSA Mini into the ultimate live production camera. Now you can turn URSA Mini into a professional live production camera by adding the all new URSA Studio Viewfinder. Unlike traditional studio cameras which are based on simple video imaging technology, URSA Mini is a true digital film camera combined with full professional studio camera features. You get talkback, tally and remote camera control, plus you can add the amazing Blackmagic URSA Studio Viewfinder to get a professional studio camera user interface. The studio viewfinder features a bright 7” screen that features a large easily viewable tally light, control knobs, large grab handles, sun shade, variable tension articulated mount and more. Comfortably work for hours on long events. Operating a camera at live concerts, sports, and other long events is hard if you have to look through a traditional eyepiece for hours on end. The URSA Studio Viewfinder has a large bright display with grab handles and external controls that make it easy to stand behind the camera and comfortably follow the action for extended periods of time. The URSA Studio Viewfinder features integrated dials and buttons that let you adjust settings without having to take your eyes off of the action, plus it includes tally lights and drop in acetate numbers so it’s always easy to identify which camera is live. Designed for professional live production, the URSA Studio Viewfinder features large handles and variable tension articulated mounting that allow you to adjust the position and angle of the viewfinder without moving the camera. It connects directly to the SDI and power outputs on your URSA Mini, making installation simple. The large 7" screen includes a detachable sunshade so you can use it day or night, and the tactile control dials and customizable function buttons let you make adjustments on the fly so you don’t have to touch the screen or look away. The URSA Studio Viewfinder features tactile controls that allow you to quickly display critical framing and focus overlays, change settings and more. A menu dial allows you to fly through options and also dial in which part of the picture is magnified so you can check detail and focus. You can also adjust the viewfinder’s brightness, contrast and focus peaking using the dedicated knobs on the right side of the screen. Plus, there are three customizable buttons that can be used to display zebra, false color, edge focus detection, luminance waveform, custom LUTs and more right at your fingertips. Frame guides are an essential function for every viewfinder, especially during live production where graphics and other elements are going to be keyed downstream. The Blackmagic URSA Studio Viewfinder framing guides can show you where a lower third, graphic, logo or ticker will appear so you can accurately compose and frame shots. You can create up to three black or white custom cursors that can have variable height, width and position, making it easy to match the location for all the graphics that will be added live or during later broadcast. 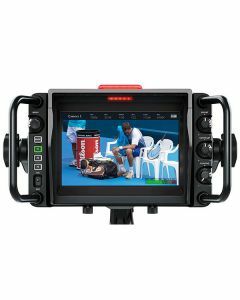 The Blackmagic Video Device Embedded Control Protocol is an advanced open communication protocol that takes advantage of blanking space in the SDI data stream to add talkback, tally and other camera control information direct to the camera via the program return feed. ATEM Switchers support and broadcast this protocol to all the cameras from all outputs on the switcher so you can remote control all your cameras and change settings, balance color, adjust focus and more. That means you don't need expensive, external and complicated systems from other companies. The Blackmagic control protocol is an open standard and is supported by multiple manufacturers, plus its also documented in the ATEM switcher manual. That means anyone can create custom solutions that are compatible with switchers, cameras and more from Blackmagic Design. The back of the Blackmagic URSA Studio Viewfinder features a large tally light that illuminates red for on-air, green for preview, and orange for ISO recording. As the director cuts between cameras on the ATEM switcher, tally information is sent back to the camera over SDI so the light is lit when the camera is on the air. In addition, the URSA Studio Viewfinder also includes clip-on transparent camera numbers that attach to the tally light, making it easy to see camera numbers from up to 20 feet away. SDI Video Input: 1 x HD/Ultra HD 3G-SDI via BNC. Power Input: 1 x 4 pin XLR 12V. Screen Dimensions: 7" 1920 x 1200 resolution. Screen Type: 7" IPS LCD. Computer Interface: 1 x USB type C connector for initial setup and software updates via Blackmagic Camera Setup software. HD Format Support: 720p50, 59.94, 60. 1080p23.98, 24, 25, 29.97, 30, 50, 59.94, 60 . 1080i50, 59.94, 60. SDI Compliance: SMPTE 259M, SMPTE 292M, SMPTE 296M, SMPTE 425M 2084. Video Sampling: 4:2:2 YUV, 4:4:4 RGB. Color Space: REC 601, REC 709, REC 2020. Multiple Rate support: SDI switches between 1.5 Gb/s HD and 3.0 Gb/s 60P HD. Controls: Dial, knobs and customizable function buttons for settings, short cut features and navigating menus. Handles: Built in grab handles for positioning the monitor independently from the camera. Position Adjustment Options: Variable tension pivot points for articulated arm and grab handles with forward, backward, up, down, pan and tilt adjustments. Mounting Options: Quick release V-lock mounting bracket for attaching viewfinder to URSA Mini handle. Tally: Large LED tally light with customizable perspex camera numbers. Metadata Support: Detects camera information embedded in the SDI signal including status information, frame guides, focus peaking, tally, and more. Screen Interface: On screen meters and status information including Camera ID, resolution, frames per second, shutter speed, gain, white balance, camera battery level, and more. 3D Lookup Table Support: LUT support for loading custom LUTs.